Summary: Difference Between Dental Papilla and Dental Follicle is that the dental papilla shows active budding of capillaries and mitotic figures, and its peripheral cells adjacent to the inner enamel epithelium enlarge and later differentiate into the odontoblasts. While Concomitant with the development of the enamel organ and the dental papilla, there is a marginal condensation in the ectomesenchyme surrounding the enamel organ and dental papilla. Gradually, in this zone, a denser and more fibrous layer develops, which is the primitive dental sac. Under the organizing influence of the proliferating epithelium of the enamel organ, the ectomesenchyme (neural crest cells) that is partially enclosed by the invaginated portion of the inner enamel epithelium proliferates. It condenses to form the dental papilla, which is the formative organ of the dentin and the primordium of the pulp. 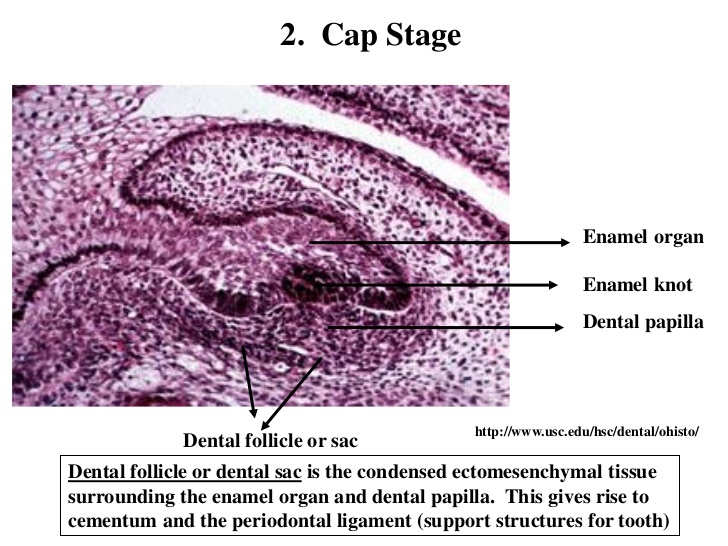 The changes in the dental papilla occur concomitantly with the development of the epithelial enamel organ. Although the epithelium exerts a dominating influence over the adjacent connective tissue, the condensation of the latter is not a passive crowding by the proliferating epithelium. The dental papilla shows active budding of capillaries and mitotic figures, and its peripheral cells adjacent to the inner enamel epithelium enlarge and later differentiate into the odontoblasts. Concomitant with the development of the enamel organ and the dental papilla, there is a marginal condensation in the ectomesenchyme surrounding the enamel organ and dental papilla. Gradually, in this zone, a denser and more fibrous layer develops, which is the primitive dental sac.